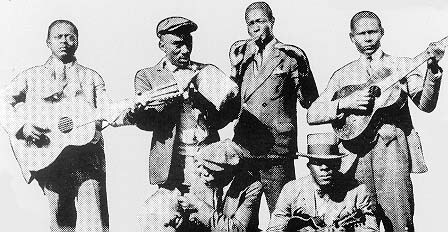 "Papa Charlie" McCoy (above, right) first recorded in Memphis in 1928, in an all-star session that saw him backing Rosie Mae Moore, Tommy Johnson and Ishman Bracey over a two-day period. Later that year, he played on the first recording of "Corrine Corrina" [sic] with Bo Chatmon and Walter Vincson, friends from his Jackson, Mississippi area home. 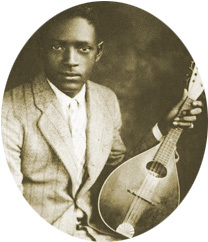 By 1930 he was recording regularly with Chatmon and Vincson, switching between mandolin and guitar. 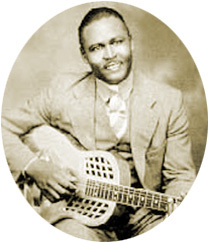 Charlie also recorded several duets with his brother Joe, and the two played together in Jed Davenport's Beale Street Jug Band. Always versatile, he even made a few solo recordings playing a delta-style slide guitar. By the mid-1930's, Charlie had followed Joe to Chicago, and in the Harlem Hamfats he blended an attacking mandolin style with their swing rhythms and jazz horns. He also contributed mandolin to recordings by Sonny Boy Williamson, Peetie Wheatstraw, Big Bill Broonzy and Will Weldon. And he again teamed up with his brother in Big Joe's Washboard Band and Big Joe and His Rhythm in the early 1940's. In the late 1940's, Charlie was institutionalized with neurosyphilis. He died in July 1950, just six months after his older brother, and followed him to the same section of Restvale Cemetery.